I thought an update was in order. The last year I haven’t posted much. It’s been a hard year for me and I don’t think I am alone. So, I need to get back to it and thought I’d give you all an update and a little gift. Last year I made a decision that I would offer Photos on Fabric as a service in the local community and set about researching how to go about doing that. Now, armed with my high quality printer I have started to do just that. I’ll tell you more about that in later posts. My new obsession, an offshoot of the pictures on fabric, is Vintage Art. I have been haunting the swap meets and antique stores in search of new pieces for my collection. Vintage Art and Ephemera can be used in Art Journaling as is. It can also be scanned, cleaned up and used for Digital Art which can be printed on paper for the Scrapbooking but it can also be printed on fabric and can be used in quilts and embroidered pieces. The possibilities are endless.I have found some pretty cool stuff, documents and pictures from as far back as the 1800’s. I have done my research on copyright so I am confident I won’t break any rules. I plan on eventually offering images for sale digitally, on fabric and on paper. 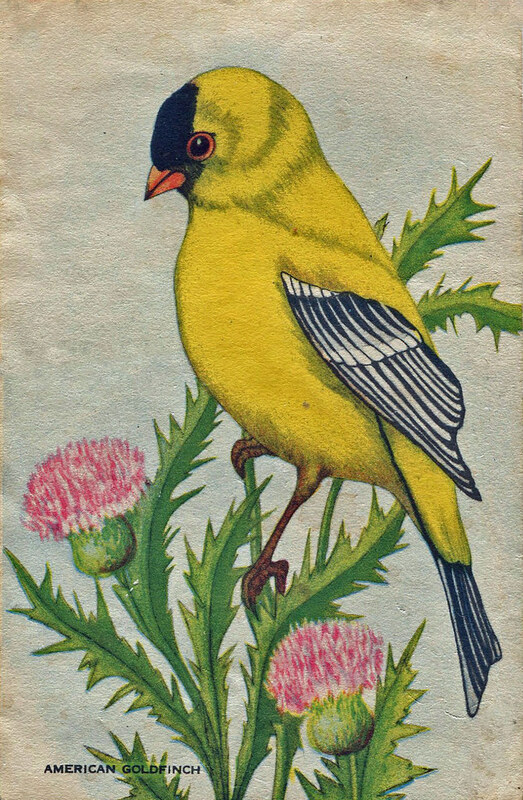 I found this vintage American Goldfinch bread card at the Swap Meet. It was distributed in the 1930’s by Armstrong’s Bread; a different one was included in each loaf. You are free to use it in anyway you like, print it on paper or fabric, use it in collage but please do not distribute the image digitally. I have been thoroughly enjoying the Vintage art and more examples will follow. In the previous post I used a print of a Vintage Cigarette Silk on the Hearts and Flowers Twilt. So, more to follow and …..Enjoy!